From transportation to electricity generation, technological advancements are shifting the ways we shop, work, live and move around. One remarkable statistic released by Bloomberg New Energy Finance last month showed prices for lithium-ion battery packs dropping 24 per cent in 2016 alone – a vital tool for both the electric transportation and energy storage sectors more broadly. At the same time, the myriad risks posed by climate change to corporate bottom lines are becoming clearer every day, a point emphasized by increasingly assertive employees, investors and regulators. A new study by the Center for Climate and Energy Solutions identified more than 1,200 global businesses that have either adopted or are planning to embrace a price on carbon over the next two years. Even global corporate leaders in sustainability are struggling to reinvent themselves in the midst of this new paradigm, forced into making tough decisions about legacy assets and future investments. Iconic industrial conglomerates General Electric and Siemens, both listed in Corporate Knights’ 2018 Most Sustainable Corporations in the World index (see here), announced global layoffs of 12,000 and 6,900 employees respectively in their power businesses in December. “Traditional power markets including gas and coal have softened,” explained GE in a statement. A look at the other companies on this year’s index finds utilities shifting their growth models onto renewables, traditional car companies placing massive bets on electric vehicles, food companies beginning to move towards more healthy, sustainably-produced food and a greater emphasis placed on rooting out conflict minerals from supply chains across the board. The transition is anything but linear, but the overall trends are unmistakable. 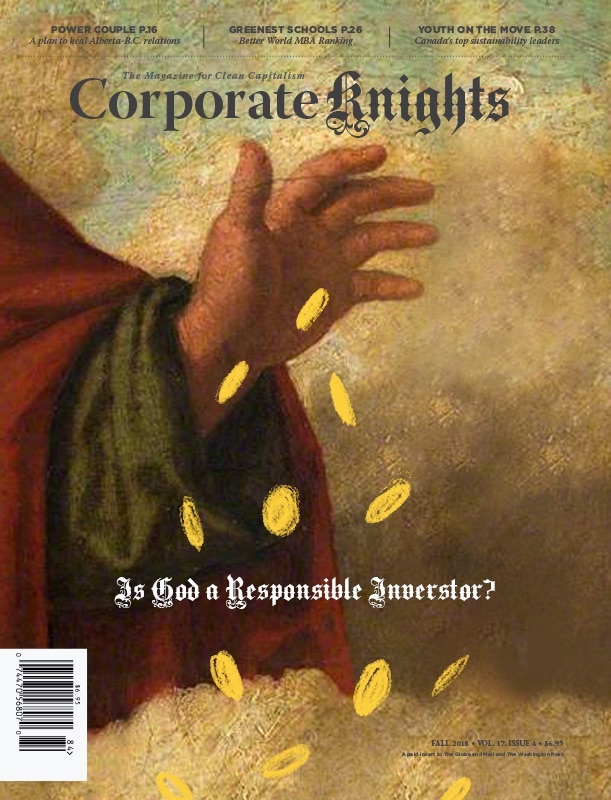 It’s in the midst of this period of both rising climate risks and sustainability-oriented business opportunities that Corporate Knights has decided to revise the manner in which our rankings are conducted. We are committed to an objective, data-driven approach for assessing global sustainability performance, and are always weighing the availability of data with the desire to measure as much positive and negative corporate impact as possible. With these guidelines in mind, our research team has implemented two major advancements to the ranking process this year. First, each key performance indicator (KPI) is now weighted to reflect the relative performance or contribution of the sector in question. The energy KPI, for example, will carry more weight for a company in a sector that accounts for significant portion of total energy use (within the universe of ranked companies) than it will for a company in a sector that accounts for a relatively small portion of total energy use. Emerging as the top company this year is Dassault Systèmes, the French multinational software company that has become a major force in sustainable innovation. Finishing 11th last year, its digital technologies have assisted companies and governments alike in adopting renewables, experimenting with various forms of sustainable mobility and the creation of smarter cities (see profile here). Following closely behind is Finland’s Neste Oil, an oil refining and marketing company that has begun directing more than 90 per cent of its investments into renewable fuel and bio-based materials. Almost a quarter of the company’s revenues is currently derived from green revenue, on track to grow up to about 50 per cent over the next five years. While it is an oil refining company, Neste is attempting one of the most aggressive bets on renewables in its peer group. In third place is another French company, automotive supplier Valeo, which has placed a strong emphasis on helping automakers reduce carbon emissions and integrate intuitive driving into the driving experience. Belgian pharmaceutical corporation UCB and Finnish construction and engineering firm Outotec round out the top five. Valeo is one of 47 companies new to the list this year, a higher turnover rate than usual that is largely explained by the methodology updates. Companies like Valeo, Itron and Chr. Hansen all have green revenue scores over 40 per cent, for example. Companies from 22 different countries made the 2018 list, with the U.S., France and U.K. leading the pack. European companies dominated the rankings, accounting for 69 per cent of listed companies, while North America and Asia accounted for 22 and 12 per cent respectively.